Ferencz Ujlaki, New York City, New York. [ADDRESS FOR PRIVATE USE,]. 2009. As the family story goes, my great-grandfather hurried to leave his homeland and his young wife to begin a new life in America. His plan was to leave before their expected first child was born. He was concerned that once the baby was born he would not be able to bring himself to leave, so off he went by way of ship to America in 1906. Ilona Ujlaki with baby son Ferencz Ujlaki, Legrad, Hungary. Black and white photographic print. Circa 1906-1907. Privately held by Lisa, [ADDRESS FOR PRIVATE USE,]. 2009. Confident of the year of his departure, I had long been in search of Ferencz' ship passenger list confirming his travel from Legrad, Hungary to New York City. The record that I found most convincing within the Ellis Island online database showed promise that it was his, but I was not certain. It listed what appeared to be a Ferencz Ujlaki (although he was indexed as Ferencz Ujhazi) traveling from what might be Legrad (although it was transcribed as Veprod) in April 1906 on the S.S. Ultonia (see row number 21 on the S.S. Ultonia passenger list for that voyage). 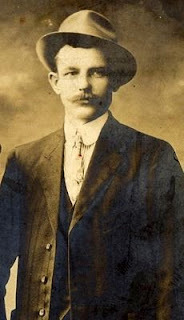 I realized that this could be my great-grandfather with his name and home village indexed wrong yet I was not certain. One reason for doubt was the fact that a village named Veprod actually does exist in Serbia/Montenegro. Now just this week - a new development! Jennifer Trahan, a fellow genealogist and reader of 100 Years in America, was going through some of the older posts that I had written. She noticed my mention of the questionable ship passenger list for Ferencz and did her own search through Ancestry's New York Passenger Lists, 1820-1957 database. What she found has left me with more questions - another family history mystery to solve! Jennifer discovered the passenger list for the ship S.S. Kroonland that departed from Antwerp, Belgium on April 2, 1906 and arrived in New York on April 12. There, second from the top, is my great-grandfather's name: Ferencz Ujlaki. Those transcribing the document for the Ellis Island database had unfortunately misread the spelling of his name so it was indexed wrong, which explains why I hadn't found it during my searches there. However, there is one complication. There is a suspicious thin line running through the text with Ferencz' information. It's meaning is told at the far right of the second row: Ferencz Ujlaki was "not on board". What could this possibly mean? I have never heard a family story indicating my great-grandfather missing his ship. I do know that he was very sick throughout his entire journey. Could he have had an aversion to seasickness and changed his plans at the last minute thinking he would go back to his wife and wait for his expected child to be born, then changed his mind again and taken another ship? On the other hand, could the passenger list for the S.S. Kroonland be inaccurate? Would Ferencz have actually taken the trip but for some reason avoided the passenger tally just before departure, leaving the ship's record in error? Most probable might be the explanation suggested by Msteri of Heritage Happens within her article about Immigration Passenger Lists: Passengers Not Sailing. Based on suggestions she learned from Manifest Markings: A Guide to Interpreting Passenger List Annotations by Marian Smith, a historian with the U.S. Immigration & Naturalization Service, several scenarios could be possible. My great-grandfather, the missing passenger, might have been aboard the ship but listed elsewhere on the ship's record. Suggested places to look are lists such as "Records of Detained Aliens", "Records of Aliens held for Special Inquiry", etc. Like other intriguing genealogical discoveries, this one certainly leaves many questions unanswered. It looks like I have my work cut out for me in order to get to the bottom of the story of Ferencz' trip from Europe to America. Who knew that instead of finding the record for a trip that I am certain that my great-grandfather took, I'd learn of one for a trip he may not have ever taken. Or did he? You can read the rest of the story at Ferencz Ujlaki and the trip he didn't take: Part 2. Special thanks to Jennifer Trahan for taking the time to search for this passenger list and then transcribe and send it to me. (Your efforts are greatly appreciated, Jennifer!) New to blogging but not new to genealogy, Jennifer has a particular dedication to source citation. Visit Jennifer's Genealogy Blog for inspiration on citing your own genealogy sources. Have a mystery of your own regarding a passenger list? Visit Msteri's Heritage Happens for the full series of articles she has written about reading passenger lists. Also be sure to visit Marian Smith's excellent Manifest Markings: A Guide to Interpreting Passenger List Annotations. Manifest, S.S. Kroonland, April 1906, microfilm roll T715_690, page 101, line 2, Ferencz Ujlaki, age 26; “Passenger Record,” digital images, Statue of Liberty – Ellis Island Foundation (http://www.ellisisland.org/EIFile/popup_weif_5a.asp?src=%2Fcgi-bin%2Ftif2gif.exe%3FT%3D\\\\192.168.4.227\\IMAGES\\T715-0690\\T715-06900492.TIF%26S%3D.5&pID=103485080152&name=Ferenz+Ujladi%26nbsp%3Bnull&doa=Apr+12%2C+1906&port=Antwerp&line=0002 : accessed 4 February 2009). Glad I could be of assistance! Thanks for including a link to my blog! And thanks again for the compliment on my sources! What an interesting story! Are there any other markings in the column where he is listed and crossed out? For instance, an "X," "D," "B.S.I.," or the word "held?" Usually they are in the left column and I don't see any there. Do keep in mind that some of the people lined out were still on board, but accounted for on another list. From what I have seen though, there should be a marking showing they were a "second class citzen" for instance. If that were the case he would be offically listed on the second class passenger list. Not seeing markings though makes me wonder if he really did not travel on this trip. Check the bottom of the passenger list and make sure there aren't any other notes that may give a clue why he was "Not on Board." I thank you for the mention and link. This all reminded me actually that I never finished the posts on this. I suppose I should do that! Will be curious what you find! I will check if you have the manifest posted here to see if I see anything, but kinda in a hurry right now, so may have to check it out more later. Let me know if this is him. I like your widget that shows me as your most frequent commenter...looks like we're each other's biggest fans.